My buddy’s band BoneHawk was in town to play a show in Milwaukee last night, and, since I knew they’d be crashing with us, I stocked up on groceries to make some brunch before they hit the road and drove back to Kalamazoo, Michigan. Morning came, and they said it was too early for food, so after they left I decided to use what I bought to experiment a little and make mini quiches. They turned out well and tasted great! Although, instead of making my own dough next time, I think I’ll just buy some phyllo dough–it would require less time and add some crispness. These would make perfect appetizers for people who are open to or curious about entomophagy, as the blended mealworms aren’t visible. Mini Mealy Quiches with Cream Cheese, Mushrooms, and Thyme! 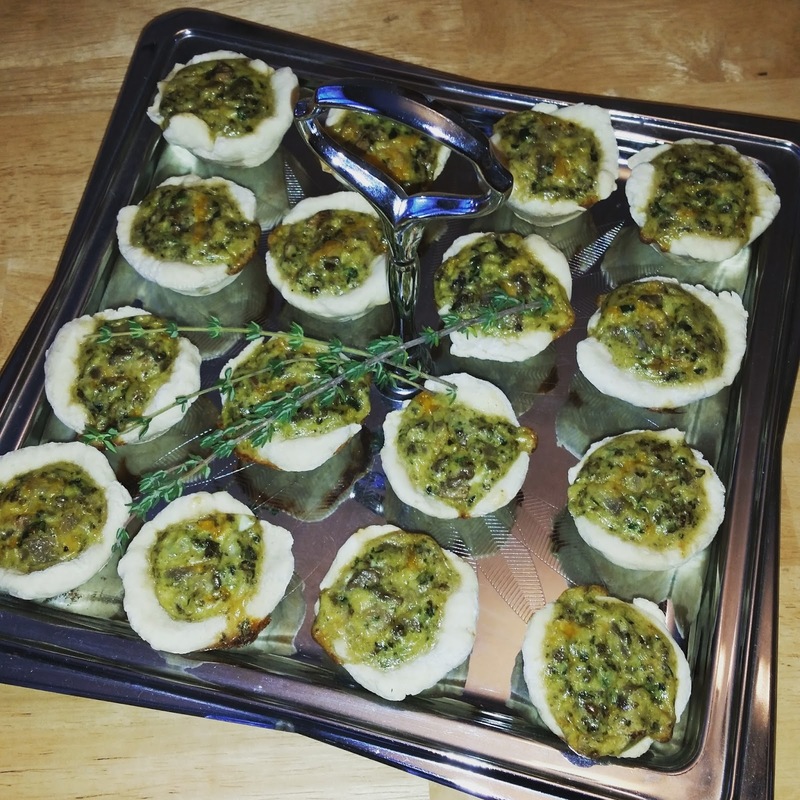 *Recipe yields 24 mini quiches and a 9″ quiche. First combine ingredients for the dough in a blender and pulse until the dough forms into a ball inside the blender. It’s kind of weird, but it works and it’s much easier than any other method I’ve tried for mixing dough! After the dough is blended, wrap it with parchment paper and refrigerate it for an hour. 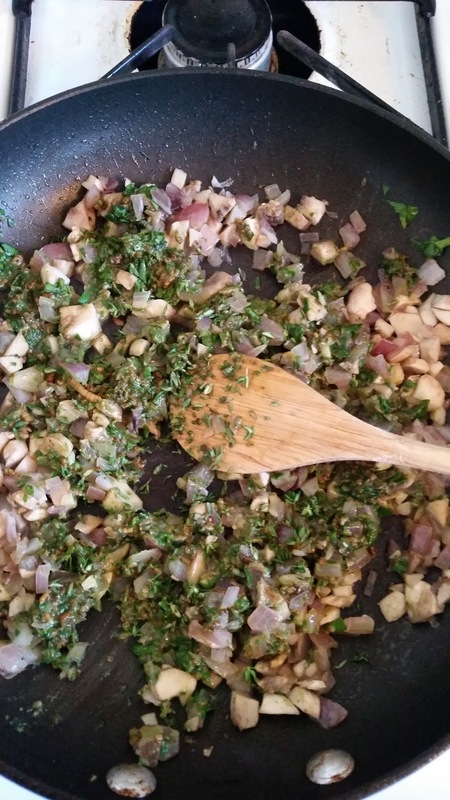 While the dough is refrigerating, start prepping the ingredients for the quiche filling. I used frozen mealworms I bought from Rainbow Mealworms. Insects are easier to manage when they’re frozen. 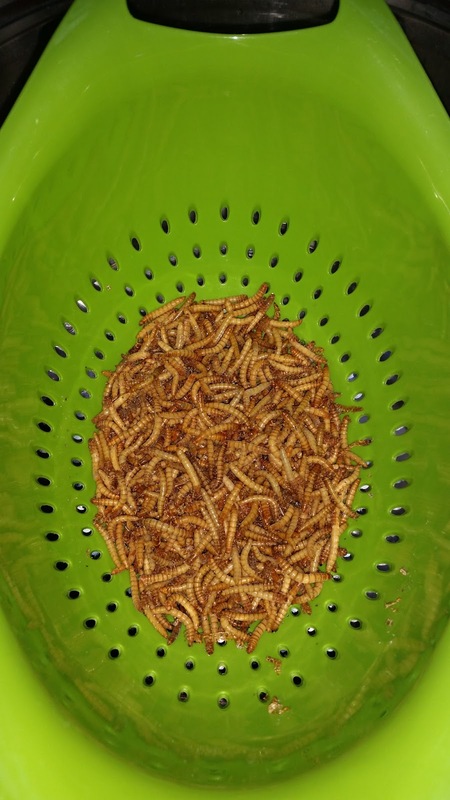 Rinse mealworms in a colander and then pat dry. Grab a handfull of baby spinach and toss it into a blender, along with the rinsed and dried mealworms. Pulse for a bit until the mealworms are not recognizable–the point here is to diminish food neophobia because, let’s face it, insects creep my friends, family, and most other people out. I’m trying to sell them on the benefits of entomophagy, so I think it’s important that insects I use are not visible. 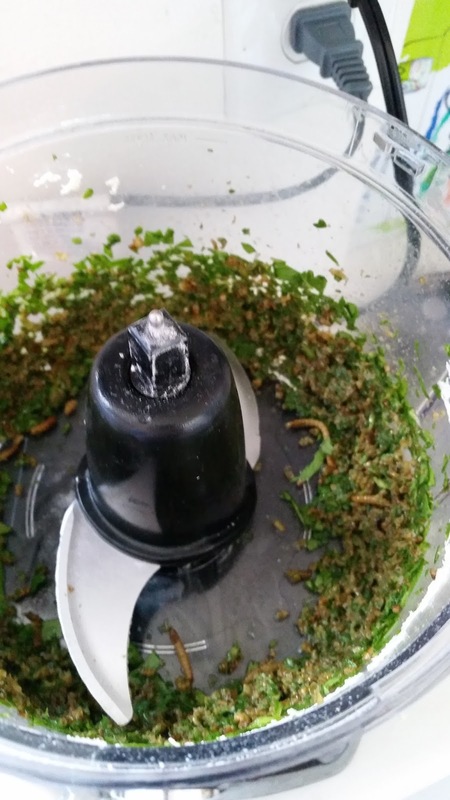 At any rate, once the mealworms and spinach are blended and everything is chopped and diced, throw the onions and oil into a pan and sauté over medium heat, then add mushrooms, mealy-spinach mix, thyme, and cream cheese. Stir until cream cheese melts, put into a mixing bowl, and set aside for later. The dough should be ready by now, so take it out of the fridge and start flattening it out. Preheat the oven to 375 °F. 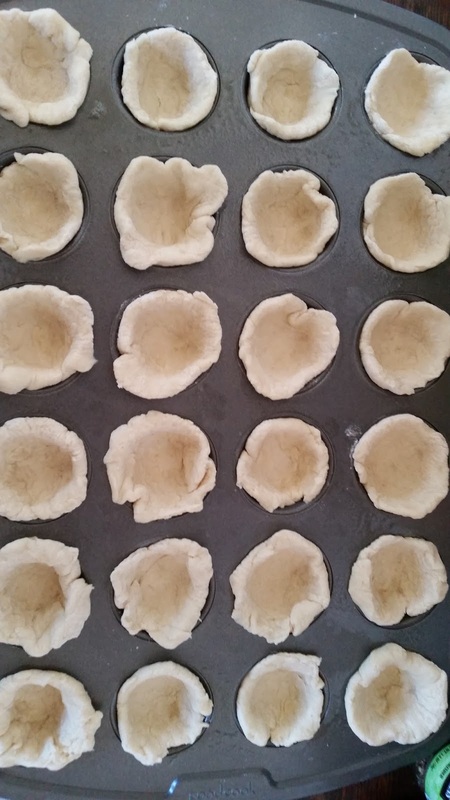 Then start pulling off small bits of dough, rolling each bit into a ball and flattening it into a circle to be used in the mini-muffin tray–they don’t have to be perfect. Mine definitely weren’t. Be sure to spray or coat the muffin tray with oil so the quiches come out easily. 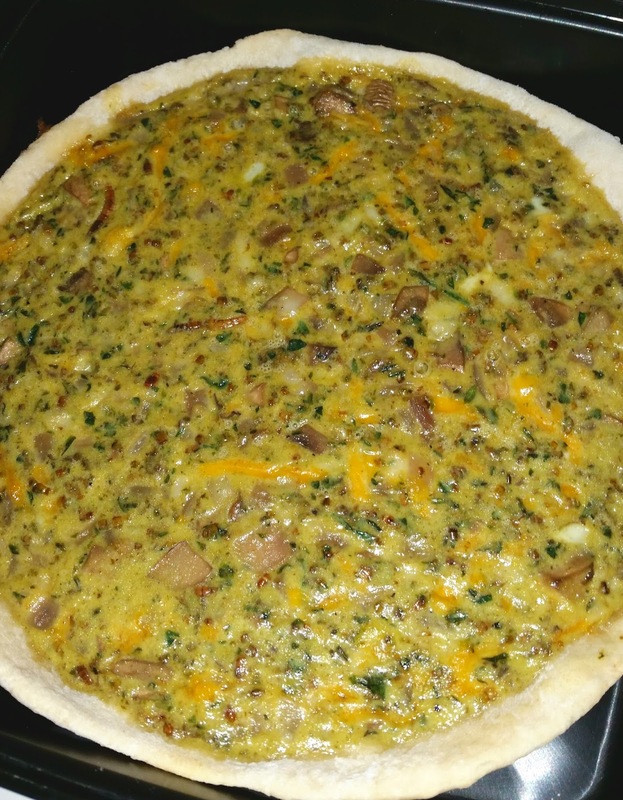 Now, get the mixing bowl with the ingredients for the quiche filling and toss in the shredded cheddar cheese and 4 eggs. Mix it and then scoop the filling into the mini-dough crusts. Bake in the oven for 20 minutes and you’re good to go! There will be extra filling and dough left, so you can use it to make a quiche to save for a day when you’re too lazy to make anything. Keep the oven on and throw it in for 20 minutes–done! I threw mine into the freezer. Enjoy! Next Post Savory Sage, Parmesan and Mealy "Pommes Anna"!